GET FIT, TONE, AND STRONG IN A PRIVATE STUDIO! personal trainer palm beach gardens cc matthews will help you look and feel your very best. your lifestyle, nutrition needs, and body is different. find out the best approach for you to get great results. Are you looking for a Personal Trainer In Palm Beach Gardens? Most people come to me because they are completely frustated with their weight,​ motivation, self-esteem, dislike the way they look, and simply need someone to help them! I know you’re sick of getting promises of weight loss and fitness only to have those promises to come up short. I get it - You want a body that you’re comfortable in, you want more energy, but you are afraid of wasting your time on programs that just don’t work. Given all of the new diets and medical breakthroughs in the health and fitness industry it is extremely confusing trying to decide what fitness program to choose. I’m here to help solve ALL of these problems for you. I will customize your fitness training program and base your program on your goals, level of experience, and lifestyle. I’m a firm believer that everyone is different and it’s important to customize a program based on the client’s lifestyle. ​The fitness and health industry, infomercials and some personal trainers love to sell quick fixes and pass out magic pills. Most people just want the honest truth without the bells and whistles. Changing your body and your lifestyle does take time, dedication, and energy, but it’s doable and worth it as long as you commit yourself to the fitness program! I will be there every step of the way helping and guiding you so that you can reach your goal no matter what! If you’re ready to make a lifestyle change and transform your body – let’s get starting now! Here's How Personal Trainer Palm Beach Gardens Will Help You! 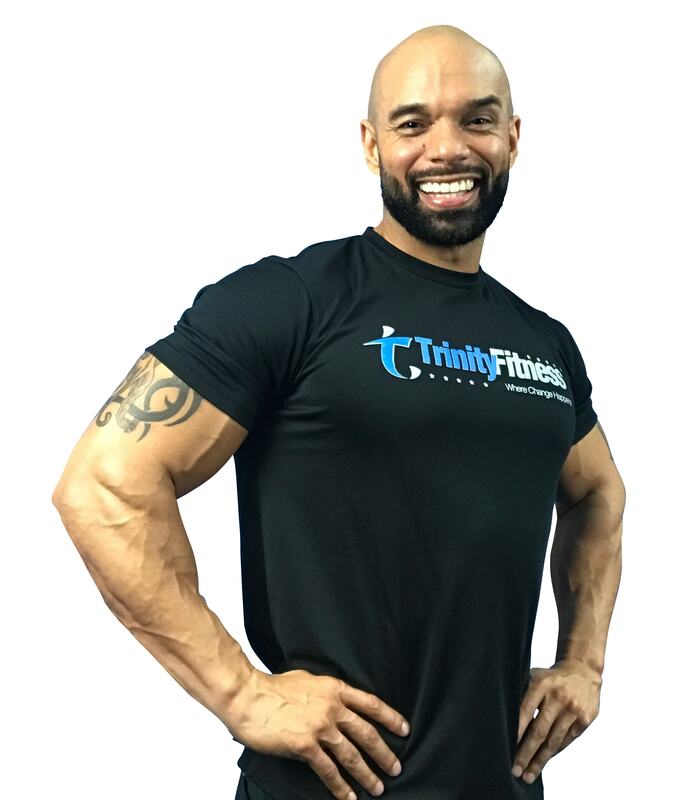 Trinity Fitness is a completely unique Palm Beach Gardens Personal Training Studio dedicated to providing the highest quality and most professional personal training services available in the fitness industry today. Trinity Fitness is not a gym; we specialize in 1-on-1 and semi-private fitness instruction. Here’s What We Offer In Our Palm Beach Gardens Personal Training Studio To Help You Get Great Results! We design fitness & nutrition to run in the background of your lifestyle. That way, you’re setup for success! Easy lifestyle nutrition. No restrictive diets and no starving yourself. NO GROUP STUFF! TRAIN AT YOUR OWN LEVEL! Any nagging injuries? Guess what… you’re not alone! We help clients move better by designing workouts to help with imbalances and burn bodyfat. No cookie-cutter group workouts here! After training men and women for 10+ years. I know what works. Let my experience fast track your success! We develop exercise programs that help get you stronger over time by progressing intensity, which is far safer and effective than trying to workout too hard right away. We are personally invested in our clients and their successes. Having us as your Palm Beach Gardens Personal Trainer will provide you with the support and guidance that you need to accomplish everything that you’ve dreamed of, and more! That Works For Your Body, Lifestyle, and Goals! Hey! I’m CC Matthews. I’m your local Personal Trainer in Palm Beach Gardens. After serving in the U.S. Air Force I decided to follow my passion in health and fitness. I’ve had the privilege of helping hundreds of men and women achieve amazing results. Now, it’s time for me to help you look and feel your very best! I Can’t Wait To Welcome You To Our Palm Beach Gardens Personal Training Studio!